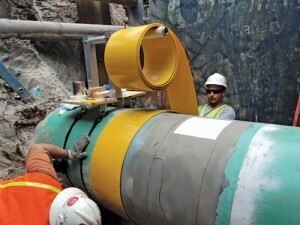 COIL PASS INSTALLATION METHOD During this typical installation method, the coil of composite material is passed between two installers on either side of the pipe. During this typical installation method, the coil of composite material is passed between two installers on either side of the pipe. In the mid-1980s, natural gas pipeline operators in North America were intimately involved in the development of a technology to repair pipelines as an alternative to traditional methods. 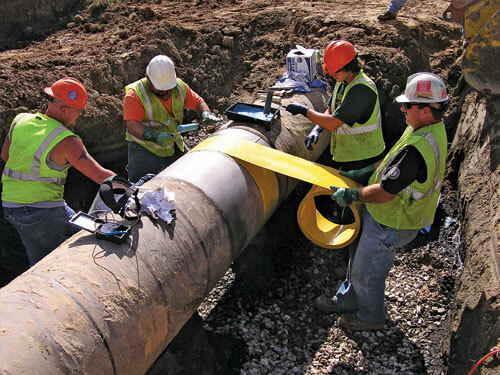 A steering committee of industry experts was convened in 1987 with the purpose of considering the use of composite technology as a means to mitigate pipeline integrity concerns in regard to the pressure containing ability of the pipe. The criteria to investigate were identified. A program of research and development efforts was established. The following decade was used to demonstrate both the short-term viability of the technology, as well as long-term engineering parameters and permanency of targeted repairs. Many components and architectures were considered. Many alternative designs were rejected due to deficiencies with regard to specific technical requirements. Following several iterations, one product with a rather specific architecture, design and specific constituent components was identified as acceptable. The industry has used this technology extensively since commercial introduction in the early 1990s. The primary goal of the research and development program was to develop a minimally invasive, low-risk means to quickly and permanently repair blunt metal loss anomalies on high-pressure pipelines. Various traditional repair methods had been in wide spread usage for several decades, each requiring the use of hot work, welding, cutting and related technologies, which raised concerns. A method of repairing pipe using modern composite technology would eliminate these concerns. The true goal of this effort was worker, land owner and public safety, while mitigating the risks associated with pipeline repairs. Many specific technical issues needed to be considered and addressed for proper validation of the long-term performance for any proposed technology. Field variables had to be minimized to insure that each and every repair was and would remain fully functional. The engineering properties needed to be clearly identified, critical engineering assessment documented and verification completed, and each required to maximize pipeline integrity and maximize the safety of the pipeline, workers and the public. Here, a spool feeder operates in a “bell-hole,” showing how this simple tool eases installation in limited excavation areas. A pre-cured, composite system was developed. It has been widely used around the globe for the last 20 years. The technology that was envisioned and developed by the North American pipeline industry has produced benefits in North America and approximately 80 other countries around the globe. The system has proven to be remarkably trouble-free. It has consistently met the original goal. 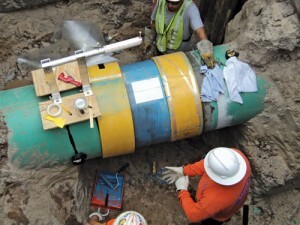 It is a safe, efficacious repair system that augments pipeline integrity and pipeline safety. Figure 1 shows a typical installation in progress. This method is known as the “coil pass” method as the coil of composite material is literally passed between two installers on either side of the pipe. Eight layers of composite material are always used. The repairs are permanent and may be installed in as few as 15 minutes per application. An occasional pipeline anomaly is encountered where clearance around the pipe is limited. This may be due to immovable bedrock below the pipeline, difficult terrain or other local issues that make passing the coil around the pipe a less than optimal method of installation. A spool feeder device has been developed to ease installation and eliminate the constraints of tight clearance issues around the pipe in such situations. With this simple tool, only a few centimeters of clearance under the pipe are required. The device and installation method is shown in Figure 2. The benefits of this simple device and installation technique are many. The workers on-site enjoy a less physically demanding repair. This ensures that quality is maintained at the highest of levels. Time and cost of excavation can be minimized. The asset-owner controls costs. The contracting company, crew or gang doing the actual field work will be able to complete work at each site quickly and efficiently. They can then move to other required tasks. Further, as the predictability of repair time is improved, project managers can better schedule crews and assets. Finally, the public interest is served with high quality integrity works, coupled with minimum of risk and the inconvenience associated with open trenches. Safety regulators (state or provincial, national or local) are well satisfied that all stakeholders are being well served. They are well familiar with this technology and its history of success and performance. Despite all of these many benefits regarding safety, integrity and ease of installation, the technology would not be commercially successful if it were found to be unduly expensive. Many pipeline operators have adopted this repair technology as their primary integrity repair system. They not only gain safety and integrity while minimizing risk, they use the technology as it also reduces the time and costs for repairs. A spool feeder device eliminates the constraints of tight clearance issues around the pipe, requiring only a few centimeters of clearance under the pipe to operate. More than 25 years ago the North American pipeline industry united in an effort to evaluate new technology and consider application of technology to the field of pipeline integrity. One of the technologies and products developed has been extensively put to use. All stakeholders have enjoyed benefits. Pipeline integrity and public safety have been augmented. The asset owner has received benefits of reduced open ditch time and reduced costs. The field repair crews have learned new skills, minimized physical challenges which require endurance and strength, resulting in less fatigue with fewer errors, resulting in improved quality and safety. Ultimately, utility rate-payers have benefited with a consistent supply of product and attractive total costs. The pipeline industry of North America sent their best and brightest people to participate in the project a quarter-century ago. Today, the public is still collecting the dividends of these investments.